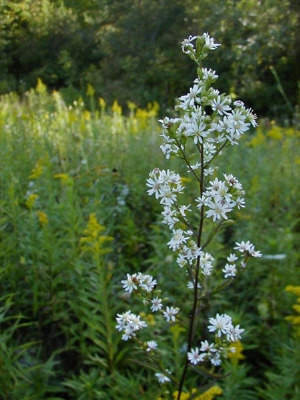 Aster sagittifolius of Michigan Flora. Dry open sandy (sometimes rocky) savannas, with oak, sassafras, aspen, and/or pine (especially jack pine); forested banks and hillsides; stabilized dunes; fields, grassy roadsides, fencerows; rarely in wet areas. Most specimens can be readily placed by the short white rays, attenuate phyllaries, and conspicuously winged petioles. Rarely a plant will have the leaf blades as strongly toothed and cordate as in S. cordifolium, but even on these the blades tend to be decurrent into broad wings on the petiole. In all but unusually shaded or otherwise depauperate individuals, the inflorescence has a characteristic pyramidal shape (or diamond-shaped outline). The disk corollas, as in S. cordifolium and S. ciliolatum, turn purple with age, but only rarely are the rays pink or blue (a result of hybridization?). MICHIGAN FLORA ONLINE. A. A. Reznicek, E. G. Voss, & B. S. Walters. February 2011. University of Michigan. Web. 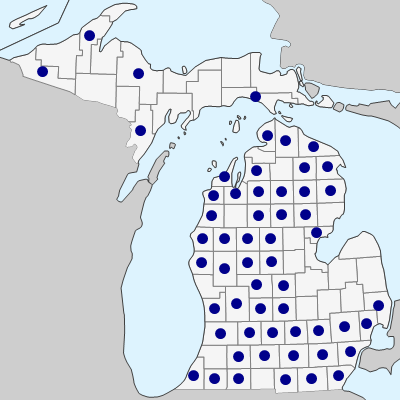 April 22, 2019. https://michiganflora.net/species.aspx?id=497.